The craftsmanship of a tight-fitting dovetail joint is the personal signature of the woodworker’s skill. Using a dovetail saw enables accuracy and precision when the cut has to be smooth and exactly right- without restricting it to joint work alone. What Are Dovetail Saws Used For? 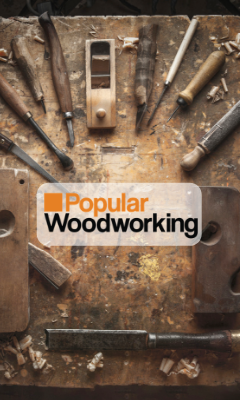 There are few basics to learn and some important guidelines to follow when using any saw, but rest assured, even the novice woodworker can learn to operate the dovetail saw like a pro. Clear your mind, focus your thoughts and tune in to your muscle memory. When the body and mind work together to achieve a common goal, beautiful projects happen. The first thing you’ll want to do is practice using either your Western or Japanese dovetail saw. Start by making a few layout lines to help you train. This is a great way to adapt your muscles and implement muscle memory techniques when learning the basics. Proceed by gripping the handle using your thumb and three fingers extending your index finger in the forward position. Practice cutting the mock pieces until you’re sure you feel confident and ready to saw your actual project pieces. Remember, training your mind is just as important as training your body. When sawing the mock layout lines, your actions should be intentional and deliberate. The best approach is to saw with purpose, doing the best most complete job possible. Try not to leave any incomplete work or excess wood. Your skills and habits as a woodworker will always show in your work. Be mindful of how your sawing techniques develop and the time spent on each segment. The dovetail is part of the backsaw family equipped with a thin, stiff blade, a straight handle, and sharp, fine teeth. On the opposing side of its cutting-edge, you’ll find the stiffening rib ensuring better maneuverability and control. Woodworkers will cut tenons and miters with accuracy making this saw the perfect tool for cabinets, patternmaking, and joinery. The basic design of having a thin, yet stiff blade calls for a stiffening cap covering the top edge of the blade for its entire length. In most cases, manufacturers use steel or brass for thickening the blade. The stiffening back carries through to the saws handle to prevent the blade from bending. This process of reinforcing the back results in limiting the depth the dovetail will cut. However, it does not restrict its typical use. When designing a project, the skilled woodworker needs pieces that are tight-fitting and secure. This saw does exactly that by allowing the craftsman to cut dovetails. When fitted together, the dovetail allows the joining and interlocking of wood to form a smooth and even juncture. Even though most of the saw teeth are for cross-cutting, a more effective pattern uses rip saw teeth. These types of saws usually contain more teeth (approximately 15—20 per inch) specifically designed for ripping operations leaving a narrower kerf. The Gent's saw, also known also known as the Gentleman's saw is a rare, much smaller dovetail, sporting a straight, turned handle instead of an open handle typical on most saws. They adapted it to make joints in smaller projects such as musical instruments, children’s furniture, baby dolls, and models. The dovetail is useful when doing miter work. Especially when the cut must be smooth and precise; providing the cut isn’t excessively deep. Dovetails in combination with a miter box will offer a fine cut which results in minimal sanding of the edge when completed. When you’re working with a Western dovetail, cut on the furthest side of your piece of wood, while positioning it in a low angle. Brace your thumb and use it as a guide by setting it next to the saw plate just over the tooth line. When using the Japanese dovetail, begin the cutting on the side nearest to the wood after it is in position. Japanese dovetails cut on the pull stroke so remember to tilt your saw, so it’s almost parallel with the sloping line of the layout on the surface of your wood. As you saw, the teeth form a kerf. Slowly, working along the layout line, lay the tooth line down. The kerf on the end grain must align squarely with your wood. When focusing on your layout line, know of your saw’s perpendicular position as compared to the total width of the section of the wood on which you are working. Always be knowledgeable of the inside face and outer face of the wood. Avoid making a kerf any larger than 90° to your outside face to avoid an obvious gap on the joint’s outside. Once the end grain kerf has aligned, you can follow the sloped layout line. Don't worry if you stray slightly from the line as long as the cut is straight. You see that this is because the pins mark out directly from the tails, canceling any effect a deviation in sawing the tails may have. Stop the saw cut at the baseline on both faces of the wood. Woodworkers may end their layout line right at its baseline as a signal to stop the saw cut. Mitering: Miter saws are rougher, having fewer teeth per inch than the dovetail. However, the dovetail is a useful option when metering as your cut needs to be exact. As a panel saw: Panel saws are most commonly used with seasoned and/or dressed stock implementing certain cutting and ripping techniques. If you are working with these types of woods in smaller pieces, the dovetail may substitute in the place of a panel saw. It is the perfect tool when using basic wood-cutting techniques. The dovetail also leaves a beautiful finish on the wood due to its number of teeth per inch. 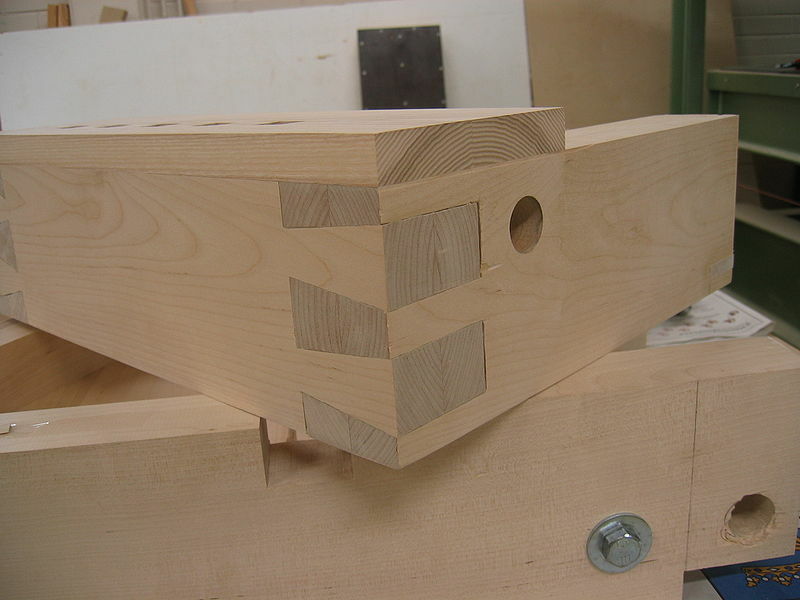 Tenon Cuts: The dovetail is perfect for most types of joint work-not just dovetail joints. 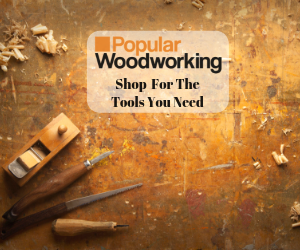 There are many tenon saws available, however, most don't appear in the everyday toolkit. A dovetail will do the same job; it is a smaller version of the tenon saw, which makes it a good and obvious alternative for this project. Finish Work: Many saws have comparatively fewer teeth per inch. This is an important fact to consider when doing ripping work. The dovetail saw is precisely the right saw for exact cutting results. In the event you're working with a higher quality wood with a closer grain, the one sure method of getting a good cut is by using a fine blade. Despite the thickness of the wood, this saw is great for building furniture and should be non-problematic. It also makes finishing your project a labor-free event as it frequently eliminates the need to sand off edges afterward. The dovetail has great features. It cuts in fine points, and the blades are thin enabling the craftsman to cut across the grain of the wood. It is like the tenon saw and does a terrific job in cutting specifically defined corners and points. For those persons working on design patterns and woodworking projects, some dovetails display a distinctive rip saw pattern. 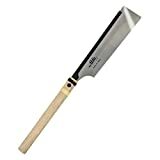 These highly recommended saws are usually between 8" and 10" long with fine, sharp teeth. The dovetail's blade is narrow and rigid with a metal reinforcement at the top. Originally, the dovetail saw was available with three types of handles; closed, open and turned designs. The main advantage in choosing the dovetail is its versatility in the wide array of projects for which it's used. The Dovetail joints are a sign of true craftsmanship. They have the reputation for their resilience to being pulled apart. The finger-shaped joints between two sections of wood provide a tight, secure, and lasting fit. Dovetail joints don't require mechanical fasteners, which make them a durable option for the woodworking traditionalist. The advantages of using a dovetail joint are that it is the most enduring of all joints and has a large area for gluing purposes. It is interlocking and attractive at the same time. Even without glue, the dovetail joint holds tightly together. Before deciding which type of dovetail you need for your woodworking project, consider its function and design. The technological advances and opportunities available allow access to state-of-the-art tools, information, videos, books, and instruction creating limitless projects for the avid craftsman. Constructing dovetails by hand is a masterful accomplishment and skill. We live in a time where we're able to use highly crafted tools like jigs, routers and specially designed dovetail bits that guarantee perfectly cut joints. As long as men and women build, there will be a need and demand for the best quality tools for the job. The dovetail saw is the right tool for you.